Ha Tinh (VNA) - The red streak that appeared in the waters around the Vung Ang economic zone in the central province of Ha Tinh – the same area still reeling from the consequences of the Formosa toxic spill – was confirmed to have been caused by algal bloom. This is the conclusion according to a report that Tran Hong Ha, Minister of Natural Resources of Environment (MoNRE), submitted to the Prime Minister, reported the Phap Luat (Law) newspaper. 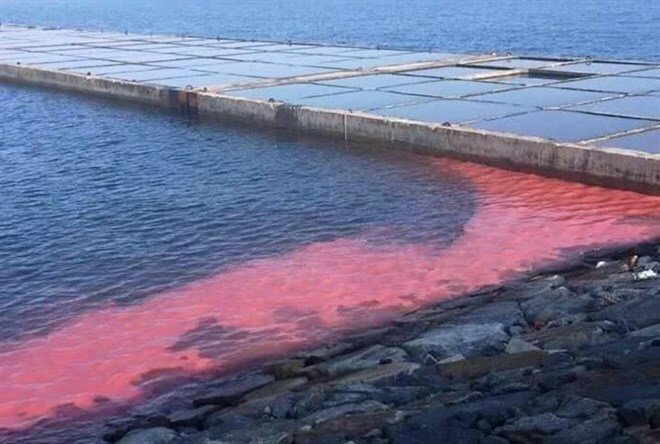 On January 19 and February 18 at Vung Ang Port, between Vung Ang Thermo Power Plant No.1 and aquacultural farmers’ production zone in the area, and at the breakwater at Son Duong Port by Formosa Ha Tinh Steel Corporation (FHS), red streaks of bubbling water could be seen. Concurrently, a video purported to be of Formosa discharging pink-coloured waste made the rounds on social media. The video was later found to be manipulated 2-year-old footage of a drain discharging in Tien Sa Port in Da Nang City. The ministry then directed competent authorities to collect seawater samples for laboratory tests. Phytoplankton samples were sent to the Hai Phong Insitute of Marine Environment and Resources, under the Vietnam Academy of Science, to be tested. Analysis of six seawater samples showed that levels of ammonia at Son Duong Port were 31.2 times higher than permitted, and surface water close to the shore and 500m away from the shore contained ammonia levels 1.34-1.78 higher than permitted. Seawater 1000m away from Vung Ang Port is safe, and the amounts of other pollutants were within safe parameters. However, three samples taken at Vung Ang Port (near shore, 500m and 1000m away from shore) and one sample from Son Duong Port showed a high concentration of Noctiluca scintillans plankton. The nearer to the shore, the higher the concentration of the plankton. Each litre of the measured seawater at Vung Ang Port contained about 46,000 cells of this plankton, and 135,000 cells at Son Duong Port. According to locals, the red streak dissipated as quickly as it had appeared. The plankton does not appear to release toxins into the water, but when they feed on large amounts of phytoplankton they may excrete considerable ammonia, and the red hue is a result of the pigments contained in the phytoplankton. In a related move, the ministry has asked the Prime Minister to direct the Ministry of Public Security to work with Ministry of Information and Communications to handle those who have posted the falsified video, including some press agencies who ran the story without verification, causing widespread concern. In April last year, wastewater discharged from the Taiwan-based steel company caused a mass fish death fish along 200 kilometers of Vietnam’s central coastline.